Public transit systems worldwide face enormous challenges. Costs are rising and infrastructure is aging. Passengers—discouraged by inefficient routes, delays, and safety concerns—are decamping for ridesharing and other solutions. The many problems that mass transit must deal with cannot be solved by a piecemeal approach. Transit managers spend too much of their time putting out small fires—scrambling to deal with issues as they emerge, from vehicle breakdowns to cost overruns. They lack a broad, comprehensive view of operations that could help them prevent these problems in the first place and create a system that functions more smoothly and efficiently overall. An end-to-end, connected IoT system gives managers the bird's-eye view they've been missing. By combining data points from every part of a transit system—from vehicle location and condition to fuel efficiency, security, and passenger use—the IoT lets managers see the big picture and make changes that bring lasting results. The right IoT system can do all this and more. With an end-to-end connected system, managers not only save time and money, but also drive an increase in ridership. Aging transportation infrastructure is creating higher maintenance costs at a time when many governments are cutting back on spending. Even with subsidies and tolls, many systems can't generate enough income to cover capital and operating costs, resulting in delayed maintenance. Poor maintenance and breakdowns cause delays in service. Frustrated passengers never know how long they'll have to wait for the next bus or light-rail train. In addition, many systems are still running on routes that were designed decades ago and no longer work for today's riders. Unreliable and inefficient service can lead to a decline in ridership—even as notoriously car-averse millennials flock to urban centers. Instead of driving or using mass transit, they're trying technology-driven solutions like Uber and Lyft. Once people start using a ridesharing service, they are unlikely to go back to public transit. Recent research has found that ride-hailing results in a 6 percent reduction in bus service and a 3 percent reduction in light-rail service. And ridesharing is still a new industry. If fewer people use mass transit, fare revenue and government subsidies decrease. This puts even more pressure on strained systems and increasing service problems, causing more rider abandonment. It's a vicious circle. Like any business losing its appeal, mass transit must start by improving the customer experience. Today's smartphone-toting passengers live in a world of instant updates and push-button service. Waiting around for a bus to arrive who-knows-when is simply not acceptable. When the American Public Transportation Association asked millennials which mass transit features they would most like to see in the next 10 years, 61% said they want more reliable systems, 45% crave a more user-friendly and intuitive travel experience, and 55% said they want real-time updates and fast, reliable WiFi. To succeed in this cost-driven and increasingly competitive environment, mass transit systems need to become more efficient and offer a better experience—and the IoT can get transit systems where they need to go. Cisco Connected Mass Transit is a good example of this new direction. 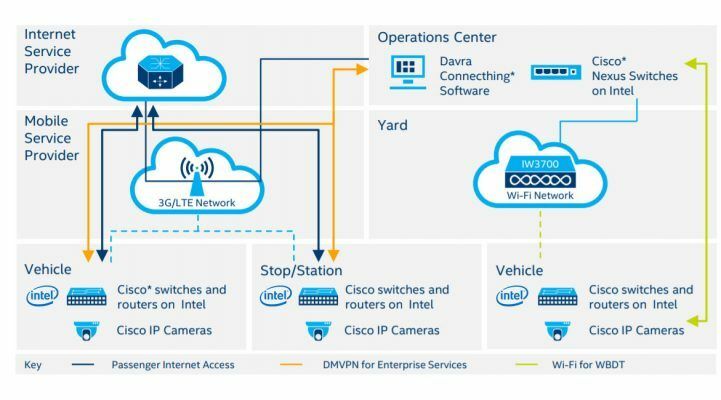 Developed in partnership with Intel and Davra Networks, this platform connects vehicles, transit stations, and passengers in a comprehensive, unified architecture (Figure 1). Figure 1. Cisco Connected Mass Transit spans all aspects of a transit system. The easiest way to understand this system is to look at a real-life example: the San Diego MTS. Each bus, train, and station in this system is equipped with sensors and communications equipment that connect a vast array of disparate systems. By combining information about transit vehicle speed and location with traffic, the system can accurately predict arrival times. This information is processed on-site and sent not only to transit managers but directly to passengers through digital signs placed in vehicles, at stops along the route, and in transit stations. When they're not flashing arrival times, these signs can be used to display digital advertising, providing transportation systems with a new revenue source. Digital screens carry vibrant, appealing ads that bring in premium rates, according to KPMG. Transit managers can lease the same space to multiple parties targeting different demographics and time periods. Commuters can get transit information not only from signs but through a mobile app. Information is updated every five seconds and pushed out within 10 seconds. Passengers never have to wonder about whether they'll get to work on time again. And if they are running late, they can use the reliable WiFi that runs the full length of the transportation system. "If you're a business person, you can finish that Excel spreadsheet and send it to your boss," said Matt Veltmann, global marketing lead for transportation (IoT) at Cisco. Or if you want to relax, "you can launch a football game or stream a movie on Netflix," he added. Providing reliable WiFi onboard is an extra initial cost, Veltmann said, but over time, it will lead to increased revenue by attracting and retaining riders. Another incentive for riders is the increased security. Video cameras in vehicles and stations send live footage to central security staff. By consolidating system-wide surveillance, the staff can spot incidents faster. And because they know the location of every officer, they can directly contact someone nearest the scene. While feeling safe and knowing arrival times are helpful features, today's riders also demand less downtime and more efficiency. Here, too, IoT changes the equation for mass transit. Though modern buses and trains have telematics, the information they collect doesn't always get where it needs to go. For example, bus equipment monitors engine temperature, fuel efficiency, oil pressure, tire pressure, and more. But this data is often locked inside a specialized system. While it's useful for mechanics, it doesn't allow transit managers to visualize trends across the fleet. The same is true for light-rail vehicles, which collect information about the switch gears that route trains onto the right track, and for a host of other systems. While people who absolutely must have the data can see it, transit managers are running blind. Cisco Connected Mass Transit takes all the information collected by all the systems and loads it onto a single platform that transit managers and others can see. "It allows systems to talk to each other," Veltmann said. As a result, managers can uncover mechanical problems early, leading to fewer breakdowns and lower maintenance costs. Combining data from systems, managers can not only know where each vehicle is but how many people are getting on and off at each stop. "Maybe they can eliminate stops 3, 8, and 17 because not enough people are using them. Then they can design a more efficient route, saving fuel and getting people where they need to go more quickly," Veltmann said. Better communication and more efficient routing translate to real cost savings, as well as an improved environmental footprint. 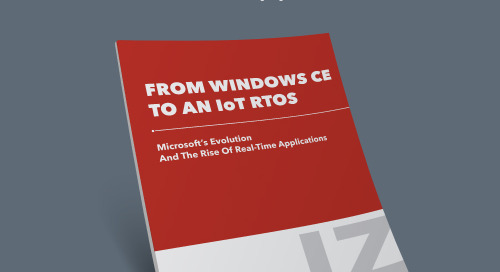 After implementing the Cisco Connected Mass Transit solution on all its trams and buses, the city of Linz, Austria reduced energy consumption by 10% and carbon dioxide output by 85 tons. Aggregating data to see the big picture is a game changer for mass transit, allowing managers to both run day-to-day operations more efficiently and gain insights for better long-range plans. And this is just the beginning. As more data is collected and analyzed over time, transit managers will gain knowledge that can help them operate even more efficiently and develop new business models to serve changing passenger needs. As Cisco transportation industry principal Kyle Connor said, we're moving into an era where "data will be the new oil." Using integrated, system-wide IoT has the potential to transform mass transit from a fragmented, floundering network into a well-oiled machine positioned for a bright future.